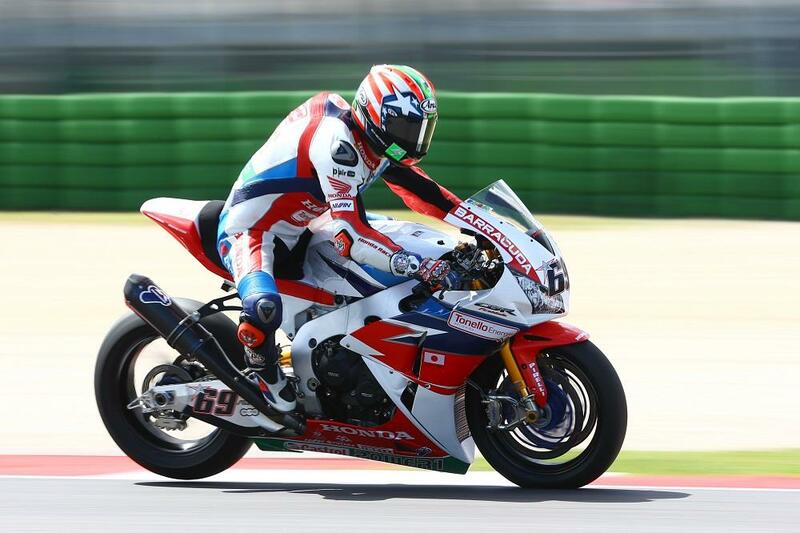 Nicky Hayden (Honda World Superbike Team) made great use of the warm temperatures at Misano to lead the opening day of qualifying action, heading off the challenge of young German rider Markus Reiterberger (Althea BMW Racing Team) by 0.122 seconds. It was a close fight for places inside the top ten in general, with the top eight riders covered by only 0.269 seconds. Third quickest was modern-day qualifying phenomenon, Tom Sykes (Kawasaki Racing Team). Of the top three today only Hayden had tested at Misano the week before the race weekend started. The only top rider not improve his morning practice time, Davide Giugliano (Aruba.it Racing - Ducati), was fourth, despite heading up the morning session. Kept championship challenger Chaz Davies (Aruba.it Racing - Ducati) down in sixth place. The top Yamaha belonged to the still-recovering Alex Lowes (Pata Yamaha Official WorldSBK Team) in seventh. Although eighth in combined times, reigning champion and series leader Jonathan Rea (Kawasaki Racing Team) was just 0.269 seconds from Hayden, as he worked on race options and set-up for the most part. Michael van der Mark (Honda World Superbike Team) placed ninth, and the top ten was closed out by early challenger on lap times, Xavi Fores (Barni Racing Team Ducati). The top ten was covered by 0.508 seconds at this 4.226km long circuit. Anthony West (Pedercini Racing Kawasaki) was 12th, one place behind the best Aprilia of Lorenzo Savadori (IodaRacing Team Aprilia). Leon Camier (MV Agusta Reparto Corse) was 15th, on the lone MV, with Aussie Josh Brookes (Milwaukee BMW) 18th.